For most people, finding the best chicken feeders may seem like a reasonably easy thing to do, and in many ways, it is. But there’s different factors to consider before buying one. In this buyer’s guide, I’ll show you the best chicken feeders, and factors to consider before you make a purchase. Where can I buy a chicken feeder? Why do you need a chicken feeder? What to consider when choosing a chicken feeder? How many feeders do you need? How much should I spend on a chicken feeder? How often should I clean my chicken feeder? How high off the ground should a chicken feeder be? Can it keep rodents out of my coop? Do I need an automatic chicken feeder? The best feeder for YOUR chickens largely depends on your flock. For example, your chickens may be prone to knocking over water, fighting over feeders, and pooping all over the place. You also might work a lot, and not return home until well after dark. 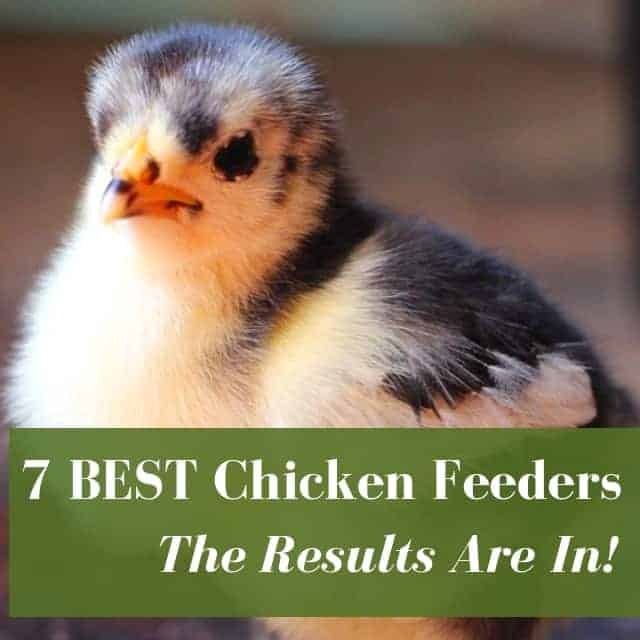 The best, and most appropriate, feeder addresses these quirks, and helps you raise healthy chickens. You can buy chicken feeders from an array of locations near your hometown and even browse through an extensive selection online and have it shipped right at your door. Chickens aren’t at all fussy when it comes to eating – in fact, most hens couldn’t care less if you dumped their food on the ground. But the mess they create – and the vermin it attracts – means it’s easier to just invest in a reliable way to offer food to your flock. A quality chicken feeder cuts down on food waste (which eases the strain on your wallet), and ensures your flock is properly fed at all times. It’s also more hygienic, and reduces the likelihood that your fluffy butts will pick up bacteria from exposing their food to their own waste. Bear in mind that you also might need multiple chicken feeders, especially if you have a large flock or bullies. One per 6 hens is usually adequate. Are your chickens baby chicks or layers? Are your hens super messy (or do you hate messes)? Or, do you worry they won’t have constant access to feed? This is so you can estimate the size and quantity you’ll need, as well as what features your new feeder should have. How much weight can the feeder hold? How much will you feed at a time. For example, if you’re planning to put 20 pounds of grain into it, make sure that weight won’t be too heavy. Will the your flock’s food stay dry and fresh? Wet and/or moldy feed can be prevented by buying a weather-proof chicken feeder. This reduces the chance your hens will eat grain full of mold and bacteria that can harm them. This is especially important during summer because flies and maggots LOOOOVE old chicken feed. Note that even though metal is sturdier, plastic and PVC are easier to clean. This prevents disease and abnormal eggs from being laid. Are there any sharp edges or anything that can hurt your hens? I don’t typically recommend chicken feeders that automatically close when your flock is eating. These feeders also have a tendency to tip over, causing waste and attracting rodents. So, check out your potential feeder and make sure it won’t harm your flock. This will depend primarily on the type of feeder. If you opt to use regular galvanized or plastic hanging feeders, then one per 6 chickens is fine. However, as a precaution always keep an eye out that all your flock members are getting enough food. You can spend as much or as little as you want. Chicken feeders can even be as basic as a dish or a bowl or as fancy as a golden automatic feeder. If you’re on a budget, you can even fashion your own homemade chicken feeders, and there are many resources online. Typically, you won’t need to spend more than a few dollars on a gravity or galvanized feeder, but automatic feeders can run a couple hundred dollars. A weekly clean up with warm soapy water is ideal. Grove Collaborative has wonderful all-natural cleaners that are economically priced and delivered to your door (on my first order, we got about $80 worth of free stuff). You can use these in your feeders, waterers, and your chicken coop. Plastic and PVC are easier to clean than metal, especially in the crevices. Take note that if you buy a PVC feeder, thoroughly check that it is indeed easy to clean. Even though it’s convenient to have a chicken feeder PVC, some of the pipe feeders can be tricky to clean. It’s entirely up to you. Hanging it keeps it cleaner because the chickens can’t poop in their dinner, and it keeps insects and rodents out of it. Just remember that storing a lot of food in it will make it harder to hang well because of the weight. Always secure it to a stud or some other structural element that can support the weight. Your chickens should easily be able to reach their dinner. The point of hanging the feeder is to reduce waste, keep the feed clean, and provide a clean living environment for the flock. You can also place the feeder on a cinder block to raise it off the ground. However, if you have baby chicks, the feeder shouldn’t be off the ground at all as they won’t be tall enough to reach it. Silkie chickens can’t fly well, so if you keep this breed, make sure they can reach the feeder, too. There is a possibility that it can prevent rodents from entering the coop because no-waste feeders mean that the feed doesn’t fall on the ground, and there’s no reason for them to enter the coop. If you struggle with vermin, it’s best to use a feeder that closes right after the hens eat. Always make sure that the coop door is closed at night to stop rats and mice from entering and getting a free meal. You can also spread herbs like PestsBGone to ward them off. Like an automatic chicken coop door, having an automatic chicken feeder can make your life easier, especially if you work a lot and don’t have much time to visit your chickens, or worry that they won’t have constant access to their grain during the day. Just check that it’s properly working every day, and remember that if they break, you will either have to fix it or buy a new one. Considered one of the best chicken feeders. Boasts a grill that stops chickens from throwing out food. Made from galvanized steel that’s built to last even during the toughest outdoor conditions. Keeps rats, birds, and mice away from feed. Can hold 20lbs of feed & can approximately feed 6 chickens for 10 days. A well-priced budget feeder that makes grain easy accessible. Rain proof and can hold up to 25 pounds of feed. Waterproof design, and can screwed into a wall or placed on a stand. Saves money by preventing costly feed from spilling. Can hold up to 55 lbs of feed. Suitable for pellets, mash, and crumbles. Prevents roosting with a hinged gable-style lid. Made from heavy gauge galvanized metal. Muddy Hill Farm Poultry Bucket Feeder for Chickens, Ducks Holds 20lbs of Crumbles, Pellet, Dry Feed. Holds 20 pounds of feed. Includes a weather shield. Reduces feed waste. Easy assembly. Made from rubber & watertight. Can hold 20 lbs of feed. Good budget feeder. Made of heavy-duty plastic. Easy to refill. For chickens 12 weeks and older. (Younger/smaller chickens can crawl in the port). Weather-proof. Keeps out rats, mice, squirrels, and wild birds. 99% of feed stays in feeder. Holds 20 pounds of feed. Refill once every week for 8 hens. Which is the best chicken feeder in your opinion? Leave a comment below! I have nothing but RAVE reviews for the Grandpa’s Feeder!! I bought one for my chickens about 3 months ago, after witnessing a rat and his/her friends coming into the coop run area at all hours of the day & night, helping themselves to the smorgasbord of feed and fresh food I would leave out for my chickens. I realized, while it’s hard to keep the vermin out indefinitely, I needed to be smarter than they are by “locking up” & eliminating their food source. The Grandpa’s Feeder took about 2-3 weeks to train the girls how to use it — it comes with directions and everything you’ll need to acclimate your chickens. I now put all other fresh veggies, supplemental herbs & feed, and or any other treats in dishes and make sure I pick it up before the chickens go to sleep at night. Nothing is left out to give the rats any indication they are invited. Other than the occasional squirrel that comes in, the rats have moved on — I haven’t seen even 1 since. The Grandpa’s Feeder may seem like a steep price to pay for “just a chicken feeder” but it’s GUARANTEED to keep the vermin out with a warranty up to 2 years!! It’s also great because there is little to no food waste either, as the chickens can’t flick the food out. You won’t be disappointed with the Grandpa’s Feeder — you’ll be asking yourself why you didn’t get one sooner!! !